Dirty toilets and sinks. Floors flooded with water. There is no toilet paper. No soap either. It is perhaps not surprising that more than 70% of Uppsala middle school students avoid going to the bathroom. It smells like urine in Old Uppsala School's girls' toilet this Thursday afternoon. Student OF and her friends pull up the toilet lids covered with traces of feces. We think that countries somewhere south have dirty toilets but we, up in the civilized north, have fixed the cleanliness problems. Wrong. We have not. If you think that dirty toilets exist only in public places, then you are wrong. Even in cafes and, sometimes, in restaurants, you will find dirty toilets, where bins are overflown with (used, of course) paper and maybe some feminine products. We don't like to admit it, but, sometimes, our newspapers look at the situation and report on it. When we go to some southern country for vacation, however, and find a dirty toilet then we triumphantly announce: This doesn't exist in Sweden! Next look at the delicious pastries on display. If they look dirty and full of dust, then this is because they are precisely so. In fact, it is not uncommon to see various species of insects lying on the windows and on the actual pastries themselves. Why, protein is included for free. Now take a look at the design of the lamp shades. All bought at the second-hand store next door, and never cleaned. They remain in the pristine condition of the day they were bought. But what is best of all, is the cleanliness of the shop. Take a look at the spoon I was given alongside with the coffee I ordered. They didn't even bother to clean it. Ofvandahl's is a famous place endorsed by no less a personage than the king [of Sweden]. 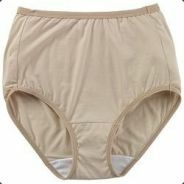 Here you see a delicate pair of underwear, for women with taste. They are displayed next to a fake rose probably picked up from a funeral shop decoration. Do not judge the size of Swedish buttocks by this display. Same shop, different style, for slightly more delicate body types. And here is the whole window. Notice, in particular, the red cloth. It's an old faded curtain which found a use in this window display. We surely like to reuse and recycle. 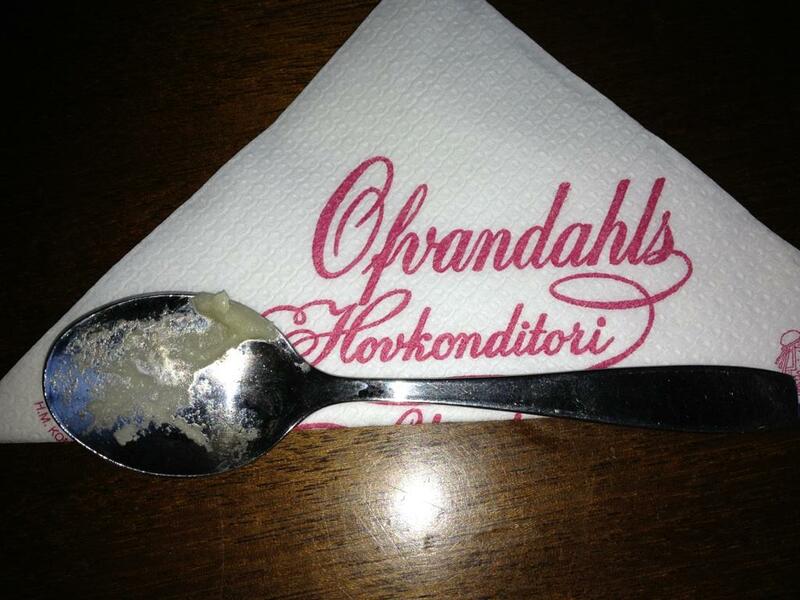 Do you think there is a resemblance to the grandmother's knickers below? Anyone living in Sweden who has traveled abroad to, e.g., the UK, France, Germany, Italy, will surely have noticed that Sweden is stuck in some kind of time warp. Somewhere in the 60s, or 70s, and, sometimes in the 40s. Not bad, you'd say, for the nostalgic ones. This is true, except that the kind of things from the past they choose to show are things you'd rather not see again. Is there anyone who liked the 70s' shopping mall luncheonettes? Well, we, in Sweden, still do. We queue up for self-service, grab a plastic tray, go through a selection of jellies, pour coffee in a mug which has been bought at the local antikvariat, and have fun. And then we go out for a walk and enjoy window gazing and shopping. 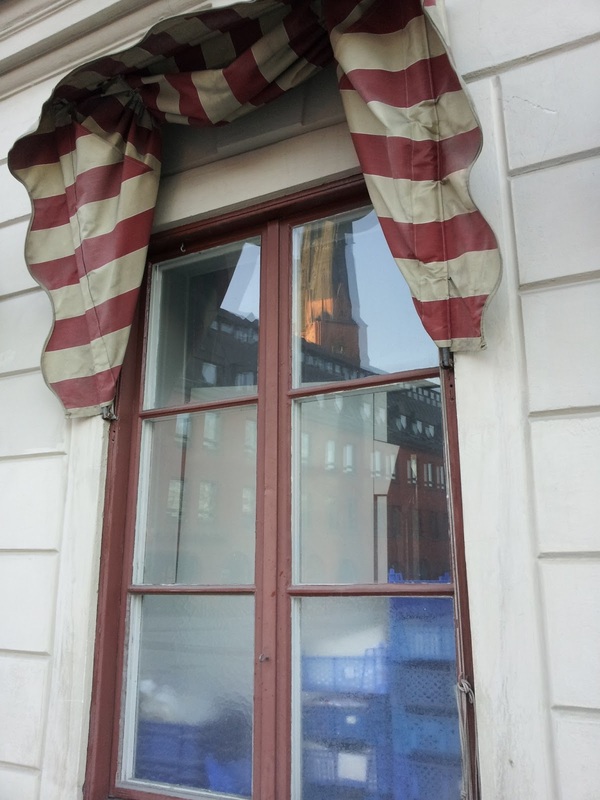 Windows, in Sweden, are something else. We decorate our shops' windows with the most peculiar, most uninteresting, often dirty, items, collected at random from some backyard, go through our mormors drawers for old underwear which we think would make our windows cute, ask our neighbor to give us his grandson's teddy bears (his grandson is 53 years old now) which we can display as a novelty item on our window, or, if, say, we are running a travel office, we go down the lake, collect some sand, shells, pieces of rotten wood, and a few nails and create (so we think) an artistic window display. 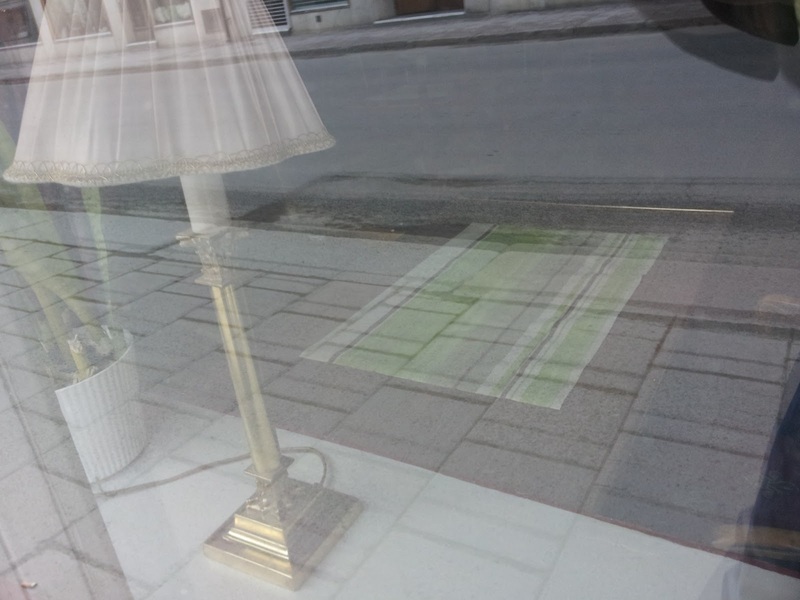 Imagine running a hairdresser's salong, charging a few hundred kronor for a haircut, and having the brilliant idea to decorate the window with white cloths, used in the past as towels, but, having developed several holes, are not useable any longer--except for window displays; and, to top it up, you toss in customer's clipped hair. Sounds unreal? Well, we do it, and we think it's cute, novel, playful, artistic, unique. No! I'm joking. Actually, we don't think at all. We just do it because we have to do something and never think about it again. The great thing in Sweden is that people are not critical at all. We learn to be lagom, to be quiet, to never criticize our neighbors, friends, or enemies. Why, are we better than them? Certainly not. So, even if we do something stupid, like displaying teddy bears wearing our grandfather's knickers as decoration for our funeral business, nobody will make any negative remarks. At best, people will look (oh we certainly are curious), develop a negative thought, and then immediately suppress it. Things are the way they are and will remain so. But it's nice to make some remarks, from time to time, to keep up with our European neighbors. We certainly think we're the best country in Europe (perhaps in the world?) and do not think that Paris has anything better to offer, shopping-wise at least, than Kiruna. 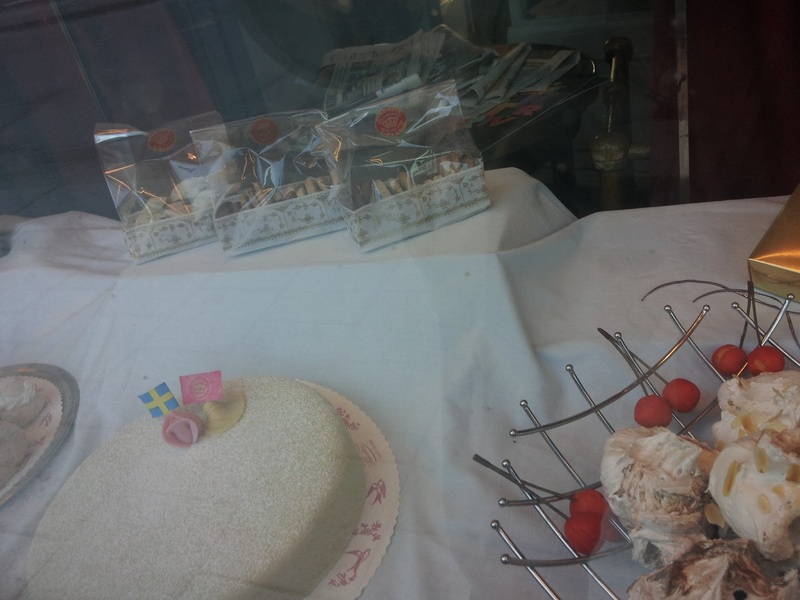 The purpose of this blog is to show the beauty of shops in Sweden. And, hopefully, it will expand to cover other images. And then we can let our European neighbors, inferior as they might be, judge how better we are. We will not, actually, admit openly that we are better, because we are lagom. But, tacitly, we know we are. Everybody knows that. Most of the time, I live in Uppsala, and so I will have images from Uppsala. But later, hopefully, I will add to the collection. So, welcome to the Windows of Sweden. I hope you enjoy it.